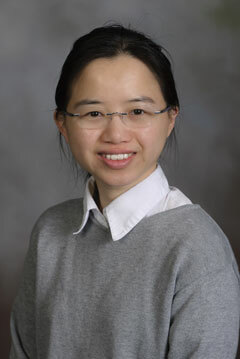 BLACKSBURG, Va., July 1, 2009 – Jessica Lu, a graduate student in chemistry in Virginia Tech's College of Science, has been awarded a prestigious Fulbright scholarship to pursue part of her Ph.D. research in Israel studying aerosols and their impact on the environment. Lu, from Torrance, Ca., will work with renowned atmospheric and environmental chemist Yinon Rudich, at the Weizmann Institute of Science. For her project, titled “Dynamic relationship between chemical transformation and optical properties of aerosols,” Lu will study optical property changes in nitrogen dioxide and ozone to help determine their role in global climate change. “Atmospheric aerosols are a key issue in climate change,” Lu said. “Until now, deeper knowledge of aerosols and their interactions with solar and terrestrial radiation has been hindered by their complex nature.” Lu will focus on the optical properties of complex aerosols. Established in 1946 by legislation sponsored by Sen. J. William Fulbright, the program is designed “to increase mutual understanding between the people of the United States and the people of other countries.” Individuals are selected on the basis of academic and professional qualifications, plus their ability and willingness to share ideas and experiences with people of diverse cultures. Lu says her career goal is to perform environmentally relevant research and transform it into an applicable policy across the scientific disciplines of chemistry, environmental science, and engineering. “I realize that the Fulbright scholarship has offered me an incredible opportunity not only to cross boundaries and work in a very active group in atmosphere and environmental chemistry, but also to experience life first-hand in a very dynamic part of the world,” Lu said. She received her bachelor’s degree from the University of California at Berkeley in 2004. The scholarship provides a stipend and living expenses for a year.